Japanese dance history is so lengthy and diverse that it actually goes back to ancient times, making an exact start date of creative movement in this culture difficult to pin down. From the first recorded mythical dances to today's modern routines, Japan has dance woven into much of its history as a nation, and it continues to captivate and inspire artists from around the world today. One of the most popular tales found in Japanese mythology is about someone dancing in front of a cave entrance to open it and reveal Amaterasu Ohmikami. This myth is responsible for the origins of dance in religion and mystical circles and continues to flourish in the sects of these ancient religions today. Bugaku, an ancient dance originally brought over from China, thrived in Japan in these early years. Bugaku is considered to be a repertoire of dances that were performed at the Imperial Court of Japan. Accompanied by Chinese and Korean music, the dancers of Bugaku wore brightly colored garments that were embroidered to the point of being considered artwork. These costumes usually came in red, blue or green. Another form of movement found in early Japanese dance history, known as Sarugaku, was more popular with peasants. It is translated into meaning "monkey music" and was found in Japanese theatre during the 11th century through the 14th century. Sarugaku mostly resembled something you would see in a modern-day circus, incorporating acrobatics in with the dancing, as well as pantomime and juggling. Some believe Sarugaku was originally developed by Asian farmers, and the terminology is still used today to describe an individual who is considered to be more of the clown of the office than a serious professional. In more recent centuries, Kabuki dancing became popular in Japan as it developed, and you can still see it performed today. The original dance that influenced Kabuki is the ancient Okuni dance. Rooted in ethnic dancing, Iizumo Okuni is often considered to be the founder of Kabuki dancing due to his development of the Okuni dance. Kabuki dancing was not always considered to be the official dance of Japan, however. In fact, even though its roots were found in pure entertainment, for generations it was passed down and performed by prostitutes. By the Edo period of Japan's history, it was illegal to Kabuki dance because of its link to questionable morale. However, despite this reputation, it was continually passed down to future generations, and changed in style as the decades went on. While Kabuki was once a simple dance, it is now a full-out performance with theatrical elements and musical accompaniment. It is now known as a story-telling dance performance, and was often used to act out real news stories affecting the Japanese people. While today's Kabuki dancing is modernized, the stylings of art - the music, dance posture and stage presence - are all authentic in form, and a great glimpse into Japan's illustrious past with the arts. Today in a Kabuki performance, you will see pantomine dances known as Shosagoto. Usually, Kabuki is only performed by men, as this has always been the tradition. However, more modern and mainstream forms of dancing has been inherited by women, and there are plenty of opportunities for females to dance as well. This was taught at first almost exclusively at school to young children, but Japan now plays host to many dance studios for both men and women. 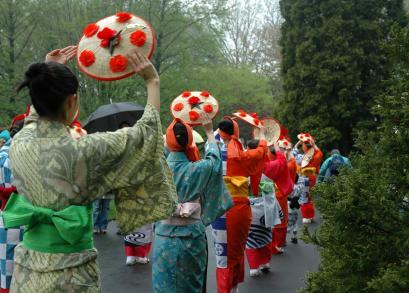 Japanese dance features both elaborate and simple costuming. Kimonos are often worn during dance performances, while other garments are minimalistic when the dance is dependent upon the facial expressions and body movements of the dancer/actor. Japanese dance is, if nothing else, incredibly theatrical, so be sure to check out a Kabuki performance or other traditional Japanese dance performance if you are ever in the country.